This piece was published in The Big Issue in April 2012. You Haven’t seen Russia Today yet? It’s worth a look. You’ll find it somewhere in the three-digit nether regions of Sky and Freeview. This is not supposed to be an unalloyed plug for the channel, merely an invitation to the curious. For while there is something temporarily mesmerising about seeing international events from Moscow’s perspective, it is hard to imagine a large, loyal audience building in Britain, where we look for restraint and balance in our TV news (if not from our forcefully partisan newspapers). Watching RT is a journey into the outer reaches of journalism. It’s news Jim, but not as we know it – a bit like landing on a Bizarro World version of Fox News. Everything looks, sounds and feels like a typical 24/7 discussion-heavy American news channel, but an insidious anti-Americanism infiltrates all discussion. The presenters, mostly dark-haired young women untroublesome to the eye, talk with a casual disdain about US economic big-wigs like Ben Bernanke and Tim Geithner as if these men were altogether mad. Perhaps they are. But even if the viewer is sympathetic to RT’s invitation to “question more” and its desire to offer an “alternative to the mainstream”, the hosts’ lines of argument are often too strange or difficult to follow. Max Keiser – the channel’s most intriguing agent provocateur – recently led a 15-minute tirade on all the ways Somalia is on a sounder economic footing than America. He believes the US dollar is dying. 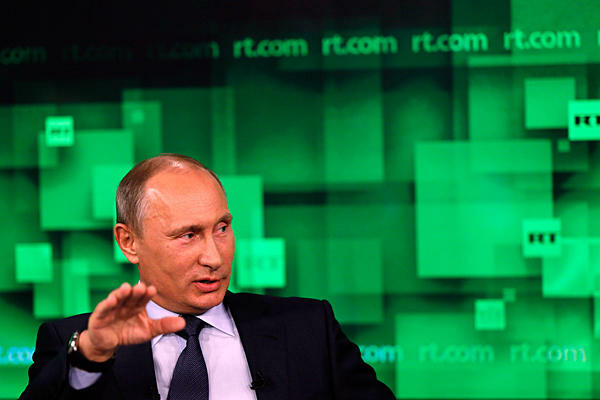 Provocative from the outset, RT was launched in 2005 as an English-language news network. Funded by the Russian government, it now has Arabic and Spanish channels and bureaux in London, Delhi, Paris, Tel-Aviv and Washington DC. It has become commonplace to dismiss the whole shebang as Kremlin propaganda, a digital-age update of Pravda, the legendary state-controlled newspaper of Soviet communism. Does it really comprise a major part of the Putin government’s PR agenda? Editor-in-chief Margarita Simonyan scoffs at the conspiracy theories and explains why she does not believe the notion of objectivity is worth straining for. Appointed in 2005 when she was just 25, Simonyan spent time as a student in the US. She is the youngest head of a global news channel. Is it possible for her network to retain independence while funded by government? The hypocrisy of the West is a familiar RT refrain. Indeed, the obsession with highlighting the flaws in western foreign policy and poking sticks at the currently precarious authority of Wall Street means there is scant coverage of life inside Russia, beyond the odd lifestyle documentary and updates on the latest government position. In a further irony, many of the pundits and experts are North American, men with rather too colourful ways of looking at the world to appear on CNN. Last year, underground radio talk-show host and New World Order theorist Alex Jones was given leeway to vent his conviction that Osama bin Laden’s body was not dumped in the Indian Ocean. The latest combative personality given free reign at RT is WikiLeaks founder Julian Assange. His first interview in a 12-part series starred Hezbollah leader Hasan Nasral- lah. It was a rather tepid affair – certainly no Frost/Nixon – but the promise of more “iconoclasts, visionaries and power insiders” is intriguing and impressive, perhaps because our own centre ground-obsessed political discourse is often restrictively narrow. RT would appear to be gaining an audience in Europe and the US that is minded to believe the very worst about their own governments. The network is keen to talk up its global reach of 480 million potential viewers (though average viewing figures in the UK are not made known) and its claim to a total view count on YouTube of around 700 million. Luke Harding, the Guardian correspondent expelled from Russia last year for unflattering coverage, says it is naive to believe the network offers truly open debate. “It has a bit more latitude than domestic news in Russia, which is very strictly controlled,” says the author of Mafia State. Simonyan is unapologetic about watching what western news channels are doing and heading the opposite direction. While many networks have focused on the brutality of the Assad regime’s crackdown in Syria, RT has presented the violence as a conflict in which both government and rebel opposition bare responsibility. The channel’s coverage of the Russia-Georgia war of 2008 was heavily criticised for highlighting South Ossetian casualties and not the actions of Russian soldiers in Georgian villages. Simonyan cites it as one of the channel’s finest hours. If geopolitics in the 21st century is to be shaped by the battle over information, it is hard to write off Russia Today as an irrelevancy. The network is driven by a desire to play a bigger role.